Search engine optimization (SEO) is no longer a secret weapon of cutting-edge, web savvy marketers. Even traditional companies have to make sure search engines like Google and Yahoo find them consistently– because search engines are the primary way prospects and influencers learn about products and services. Too often, companies ignore search optimization or shelve requests for it simply because senior management does not understand it well enough to provide the necessary leadership and support. And if top management does not view it as priority, marketing and sales people are disinclined to pursue it. They will apply traditional, “accepted” tactics, shying away from one of the most efficient, measurable ways to get in front of prospects. Too often executives focus on the technical aspects of SEO and lose sight of the more important strategic aspects. Meta tags, spiders, hits and visits don’t mean much to company stakeholders and shareholders. Results—in terms of better leads and more of them—do. What do we want our web visitors to do? Whether your desired response is a demo request or a completed inquiry form, management should know and agree upon this ‘primary’ action and communicate it to all stakeholders. You may have a few different actions that you wish to track. How many search visitors per month actually do what we want them to do? Since we are only talking about SEO in this article, we are only interested in search visitors. Knowing this number now and tracking it each month, will give you quick insight into the quality and quantity of your search traffic. Do not be surprised to learn that as much as 99 percent of this traffic is not taking the desired action. Pulling in the right traffic and converting it into bona fide leads is a never-ending challenge. Knowing how well (or poorly) you’re doing in this area is a big first step. What percentage of search visitors leave our website within 10 seconds? This magical statistic, which I like to refer to as ‘short visit syndrome’, obviously relates to all of your web traffic. But focusing on search visitors tells us a couple of things. First, are you pulling in the right search traffic? Second, is your website doing an adequate job of ‘hooking’ them or giving them what they are searching for? It is not at all uncommon for companies to spend lots of money and resources to drive search traffic, only to have the overwhelming majority leave within 10 seconds. Which search phrases are we focusing on? You want to come up on the search engines for the phrases that your best prospects and influencers are likely to type. You’d be surprised at how differently people actually search, compared to how your sales and marketing people think they search. This is because most searches occur in the research and investigation phases of the buying cycle. In fact, more than half of all B2B searches for purchases over $50,000 occur between two and six months before a purchase is ever made. And often, the person doing the searching may not have the technical understanding of your product or service. The key is to consider carefully how your audience searches (there are some great research tools out there) and come up with a list of approximately 20 phrases that become your company’s target phrases. These are the phrases that you should measure and focus your resources on. How often are we appearing for our target phrases? Too often, a webmaster, marketing manager or even CMO assumes everything is up to par because the company appears at the top of Google for their company name or some extremely specific, non-competitive phrase. It’s important to know how often you are coming up on Google (as well as other major engines like Yahoo and MSN) for your target phrases as a whole. While it may be more rewarding to focus on where you are coming up, it is more productive to see where you are not currently coming up, and thus missing opportunities. How often are we appearing compared to the competition? If it’s important for you to know which major tradeshows or events your competition attends and exhibits at, wouldn’t it make sense to know how often your competition is being found on the search engines compared to you? After all, the Internet and search engines have become the largest, most prolific tradeshow on earth. 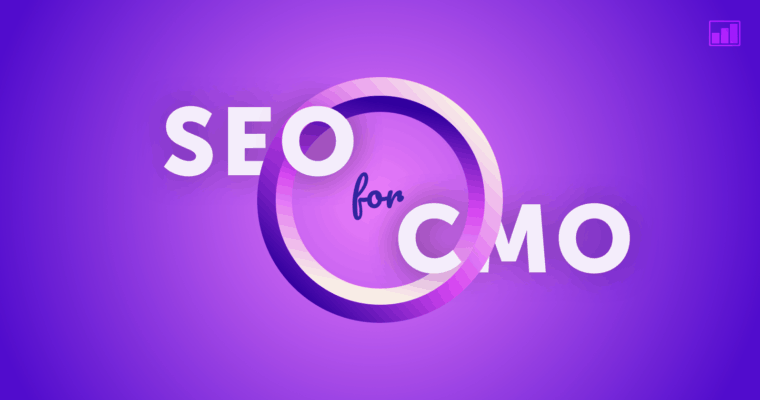 Obviously, there are other and even more important things that a CMO would want to know about an SEO effort– number of opportunities generated, cost per opportunity, revenue produced, etc. Many executives assume that someone is tracking this information and reporting on it. But more than likely, no one is. Beginning to capture and act upon some of the basic points in this article could be the catalyst to help measure the true effectiveness and production of your internet efforts. All of this data should be readily available to you if your company has developed a prudent search optimization strategy and implemented some basic and widely available tools. If you are not getting this information, you are missing an increasingly important business development medium. Compared to the amount of energy and resources you are currently spending to generate new business, SEO may be the most effective and cost-effective way to fill your pipeline.